Vancouver is one of Canada's most magnificent cities with a vibrant waterfront and a sparkling skyline that is surrounded by majestic mountains. The scenery, friendliness of the locals and all the great dining and entertainment venues make this one of the most livable cities in the world. Your best advice is to spend as much time as you can here enjoying the sights and activities both within the city and in the surrounding area. Surrounded by beautiful mountain peaks on the Gastineau Channel, Juneau has the massive Mendenhall Glacier and the immense Juneau Icefields at its back door. Juneau is known most for the Tongass National Forest, its rustic shops, kayaking, dog sledding, rafting, hiking, whale watching, flightseeing and fishing. One of our favorite activities is to take the Mt. Roberts Tramway for a great hiking and photo opportunities. 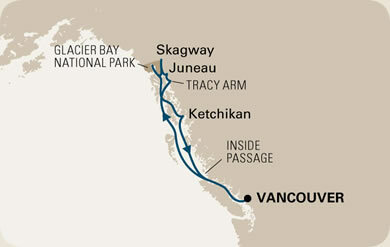 Skagway is one of Alaska's most popular ports of call. It was put on the map by the hoards of stampeders bound for the gold fields back in the late 1800's. This historic town has an old time feeling with its gold rush era fronted buildings and wooden sidewalks. With mountains, coastlines, river, lakes fjords, and glaciers, Glacier Bay National Park has a diverse and unique ecosystem. Ketchikan is the first city on the inside port of Southeast Alaska. Beautiful and rustic, Ketchikan is sure to please all of your senses with its majestic mountains, carved wooden totem poles, museums, and local shops. The locally owned restaurants are sure to please the palette.